Teachers sharing their stories of running and staying fit. Follow our hashtag on twitter: #runteacherrun and join our Facebook group! I want to tell you about a new running belt I tried recently. Enter the running belt. With a good running belt, I can still carry my "essentials" (yes I realize MY list of essentials may be different than yours. To each his/her own!) and still be comfortable. There's nothing worse than feeling hindered or uncomfortable while running. This belt did NOT make me feel that way. So what belt is it? I had the opportunity to try the SLS3 running belt. Yes, I tried it while running on my treadmill. (What? I need stuff while running inside too! Plus, it's been really cold up here! My southern blood does not enjoy winter temperatures in the midwest.) SLS3 has several types of running belts, but I tried the Dual Pocket Water Resistant one (in black!). I was a little doubtful that my phone would fit. The usual problem for me with running belts is that my phone only fits without the case. News flash: I don't ever want to run without my phone in its case. I've been known to drop my phone a time or two (okay, WAY more than a time or two...). I've even been known to drop my phone while running. Thanks to Otterbox it doesn't matter because it's protected. So in THIS belt, my phone fit. My iPhone 6 in its Otterbox Defender case fit! And I could still zip the belt! I could also UNZIP it to take out my phone. Perfect! The other pocket I devoted to my running snacks (fruit snacks -- yum!). During my 6 mile run, the belt stayed put with very little movement. It also didn't rub or bother me. Hooray for comfort AND functionality! Even better, want to enter to win one for free? Here's your chance! Don't forget to follow SLS3 on all of their social media pages because they have WAY more than just belts! Thanks for reading & happy running! Okay, so Week 1 is officially finished and it went well. It was not easy to get going but I did everything on the plan. I walked 3 days (2 miles each time was on the plan). Seems I walk about a 17 minute mile which is very slow. I may add some running in over the next few weeks. Straight walking seems to be harder on my calves than running is. I went to Yoga 3 times. I went to a few different classes as I try to figure out what makes sense for me. Ideally, since I also want to lose weight, getting cardio in during a yoga class makes sense but there are very few that are easy enough for me to actually participate in but hard enough to give me a workout. I am lucky to have a few great yogo studios nearby and each offers something a bit different. I am spending these first few weeks figuring out what the difference classes do and which I like for which reasons. I definitely feel better at the end of this week than I did at the beginning. I loved the feel of a good workout in a more difficult (for me) yoga class today. And I've been sleeping a bit better which is always good! It's been 2 years since I ran 2 5Ks. I started a 16 week program with an online coach in January of 2012 and that May and July I ran 2 5Ks. I was very slow but I worked hard to get to the point that I could run 3 miles without stopping. Then stuff happened that got me off track. I've started up a few times but never got back to actually running. I turned 50 this year and I am in the worst shape I've ever been in. I have not made exercise a priority--going back to the classroom 2 years ago and changing grade levels took more time than I realized and I found myself working far more than I should have been. Very little work/life balance these last 2 years. #1--I am going to work hard to limit my work. I tend to stretch out writing and planning so it takes all day instead of a few hours. So I am going to try to set aside a certain amount of hours on the weekend and only work during those hours (work includes schoolwork, blog posts, reading books for review committees, writing articles, etc.). Some weekends might require more work than others but I am going to set time and make sure I stick to it and make time for other things. #2--Training for a 5K two years ago made sense but one thing I realized was that I didn't get the cardio and mileage that I needed. So instead of training to run a 5K, I am going to train to walk (fast I hope) a 15K. I found this training plan that I plan to follow starting on Monday. It will give me more mileage and build my stamina a bit more than a 5K I think. I need to get into some kind of better cardio-health. There is a 15K here in Columbus in mid-November. I'm not sure I can walk fast enough to do a 15 minute mile for 10 miles (which is required for the race) but it is a good maybe. We'll just have to see how it goes as I have absolutely no idea how long it takes me to walk a mile right now. #3--The one thing I have found I love is the combination of cardio and yoga. I did hot power yoga 2 years ago and it was far too difficult. But I loved it and got stronger. My daughter suggested I begin a beginner yoga class and learn HOW to do the things I am supposed to do so I found some great beginner yoga teachers and am ready to move on. I plan to do at least 2 yoga classes a week, starting out with easier classes but moving on as I build cardio and strength). #5--I have to change our eating habits at home. I am usually pretty good at breakfast and lunch if I plan ahead. We tend to eat quick at home because we are always in a hurry and we've gotten out of the habit of planning meals so we'll start that up again. Healthier dinners. So tomorrow I am walking (sauntering) our Dublin 5K. And on Monday, I'll begin the 15K plan. It is a busy week with our district leadership academy and a few other full days of PD but it will be a good way to start because making time for exercise is never easy. I'll just have to work around other commitments. I'm hoping to report back on the blog weekly. Yes, I'm still running...and I hope you are too. It was a long, cold winter. Many of us grew to hate our treadmills. Others took extended breaks from running. Whatever your story, it's time to return to the #runteacherrun fold! Spring is here and summer break is right around the corner for many. We welcome you back to running with open arms! I trained some for this half marathon, but not to the intensity that I have in the past. I didn't follow a training plan. I ran sporadically. If I didn't feel like running, I didn't. Guess what? It showed in my finish time! It was my slowest half marathon ever. Don't get me wrong. I'm thankful that I was able to RUN 13.1 miles after foot surgery only 8 months ago. Every time you make it to the finish line you win. Out of the mouths of babes, indeed. So, I celebrate my finish but I'm also reminded that with running (and life in general), you get out of it what you put into it. Yes, I can embrace every single finish line as a success but if I am in search of a faster finish time, I'll have to work for it. It won't just happen by chance. To be a faster runner, I have to train! I'll need to do that dreaded speed work on a regular basis. I'll need to be consistent with my running and push myself. Will it be uncomfortable? Absolutely! Will it hurt at times? Probably! But setting a goal and working toward it is never a bad thing. It's time to step out of my comfort zone and get to work. Now that spring is right around the corner (surely it is, right? )...some of us have actually made it back outside to run. I know some of you die-hards run outside all winter, but I get pretty friendly with my treadmill once it dips below 25 degrees! In the winter, I binge on Netflix movies and tv shows during my running time. When I finally head outside, I forget how wonderful it is to lose yourself in a great playlist of high-energy songs. But how do you make a great playlist? Who has the time to download and put together songs in the right order? Not me. I'm horrible at it and usually end up pressing shuffle or fast forward quite a bit when I'm running. But not any more! During one of the #RunChat twitter talks (can't remember the month...), I found out about a great app for my phone called Rock My Run. 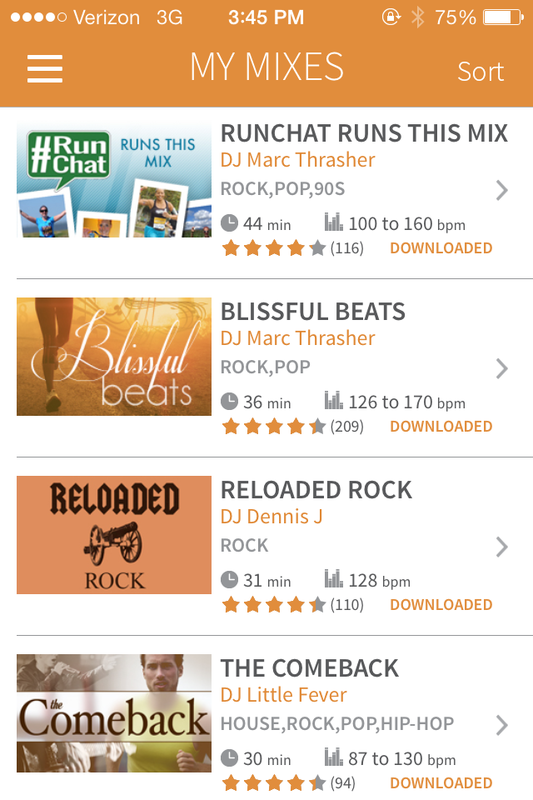 Rock My Run is an app for smartphones "that provides The Best Running Music in the World for active people." It's a free app and Standard Membership is also free. Yes, there's the ability to upgrade to a paid Premium Membership, but I haven't tried that yet. I think an advantage of upgrading to a paid membership (for me) would be to have access to downloading running mixes longer than 45 minutes. I'm already thinking about this option for my next half-marathon. What do I like about Rock My Run? I love that I can download a complete run mix to my phone without having to hook up to my computer or some other nonsense. I also like that the mixes are already calibrated to specific BPMs. For me, that helps me stay on track! I respond to music innately so songs with faster bpms automatically make me pick up my pace. I like the diversity in the music too. Yes, sometimes it has a bit of a techno/dance club feel to it as the songs transition, but that usually depends on the DJ. Currently I have 7 different mixes from RockMyRun: 3 are 45 minutes long and the other 4 are 30-36 minutes long. 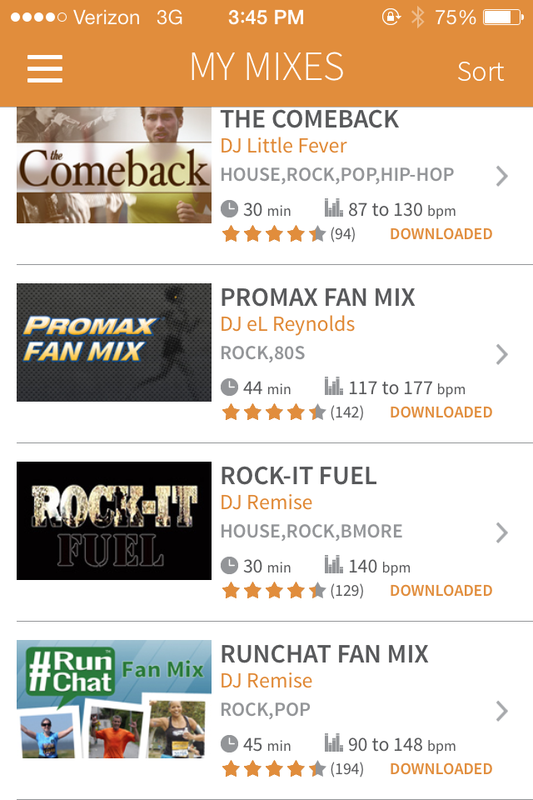 My current favorite mix is the RunChat Fan Mix. With tracks from Lorde, Train, Adele, Jay Z, Daft Punk, Bruno Mars, Robin Thicke, Mumford & Sons, Run DMC (It's Tricky! ), and more... it is a great smash up of current and past pop songs. I suggest you give RockMyRun a try! No, I don't receive anything if you do and no, I didn't receive anything to promote the app here on our RunTeacherRun site. RockMyRun is just my newest favorite running tool and I think you'll love it too! Three years ago when I was visiting my parents (who live out of state) as I do every summer. My father, who is diabetic, is never without a diet Pepsi in his hand (going through about 20 a day) now has to give himself shots for a disease that just a few years ago his doctors told him could be controlled with diet and exercise. Was this my future? I knew then something had to change. I scheduled a physical the week I returned. My doctor told me I could stand to lose a few pounds (she was being gracious) and was concerned that some of my other issues, like insomnia, lack of energy, and depression were exacerbated by my lack of activity.Things had to change. This isn’t the story of a girl who grew up active and fell off the bandwagon after college. I wasn’t ever an athletic kid. I didn’t grow up in an athletic family. I really had no idea where too start. Team sports were daunting and I joined a gym with good intentions, but never got up the guts to go. What I did have in my favor is location. I live within walking distance of two state parks and the Appalachian trail is just a quick drive from my house. So I started hiking. My dogs were especially happy with this new routine. I loved it. Something inside me just sort of clicked after several weeks of hiking. If I can walk and hike, I thought, I can run. So, like Forrest Gump, I started running. Well, it wasn’t quite that epic. The first time out I ran about a tenth of a mile and walked another four. But I kept going. We had a treadmill in the basement that I dusted off. I started making deals with myself while watching shows on the DVR. Walk during the show, run through the commercials. Soon, I was running through the show and walking during commercials. Finally, without really realizing it, I broke a personal record and ran six miles in 1 hour. SIX MILES! The girl who never thought of herself as athletic was running. Now I was confident enough to try out some 5Ks. There was a zombie run and a few mud runs. Then I got the crazy idea to run a half marathon -- not an actual organized event, I wasn’t ready for that. Instead, I mapped out a route locally and after about two months of training, got out there to tackle those 13.1 miles. There was some walking, there was lots of sweat, and it wasn’t pretty, but I did it. Such an amazing feeling to know that my body, the one I had spent most of my life feeling uncomfortable in, was now strong -- strong enough to tackle some pretty incredible challenges. But pride (and a smaller waistline) weren’t the only benefits I’d noticed. I was sleeping better, I had more energy, and I’d found an alternative to eating my feelings. There is nothing like coming home from an especially stressful day and running until I can’t run anymore. My last physical turned up great numbers - all the numbers that used to be of concern are now well in the normal range. I am not the fastest or the most graceful runner. Any sort of physical activity seems to turn my face a lovely shade of tomato red and I sweat like it’s my job. Somedays I walk more than I run, but I still get out there. Judging myself against the progress of others is something I let go of long ago, instead I focus on how far I’ve come. I am strong and I am a runner. Something I couldn’t have imagined three years ago is now something I can’t imagine ever being without. Danielle has been a high school English teacher 14 years and a geek her whole life. When she’s not out running or hiking, she can usually be found lost in a book. You can follow her literary and school related adventures and misadventures on twitter (@MyMercurialMuse) or on her blog (www.MyMercurialMusings.com). Well, 2013 was not a great year in terms of meeting any of my goals. A ridiculous concussion with a unique healing-turned-into-migraine cycle, followed by drugs that didn't really help, made for a pretty blah year in terms of getting things done. It was a real bummer as I spent 2012 working hard to get in shape (Couch to 5K and Yoga) and read lots. So, now, at the end of 2013, I am kind of back to where I was a few years ago. But when I look back, I learned lots. I am not good at slowing down and the Concussion Year forced me to do that (since I had nothing else to do). I realized that the goals aren't really so important. Having a time in my life that I couldn't read, work or exercise was fascinating. I really had nothing to do as I don't have many hobbies not related to reading, work on computers. So, it forced me to take a break and to think about what I love and how I want to spend my time. During my first week of the concussion rest, I told a friend that I thought God was telling me I needed to rest. She said, "He has been trying to tell you that for a while. You just weren't listening." Good friends say what you need to hear, I guess. Anyway, going into 2013, I am just celebrating the fact that I can read again. And I can exercise again. And I can work a lot again. And I can write again. I do love work. But I did learn that I also love rest. And I learned that I haven't been taking care of my own learning. And I learned that I got so busy that I didn't even realize it. And I realized that once I had to quit on all of the ongoing projects I was involved in, it was okay. 2014 Run Teacher Run Challenge- join me? *Encourage 4 teacher friends to run/workout and join us here in this group! I'll modify in a few ways. I definitely want to work out at least 14 times a month in 2014 and I want to post at least 14 times on the Run Teacher Run page. I'll also encourage others to join the group. In terms of races, I am going to try for 1 race or virtual race. I am not a big fan of races so one seems like plenty to me. And I am not going to set a mile goal. I am a very slow runner (15 minute miles--slower than walking). I think my goal will to be to keep track of my mileage in 2014. That's all. Just to begin that habit. I also started a membership to My Yoga Online. I love going to the yoga studio and we are lucky to have a few great ones and lots of great teachers here. But, some days, I just don't have the time for the driving, set up and 1 hour class. My Yoga Online has all different classes that I can do at home with my membership. If I add this as an option, I should be able to fit in 3 yoga classes a week. So, I have always been fascinated by people who have a word for the year. I haven't really had one of those as I could never think of the write one. But I think I have one for 2014. I was looking for one and have been pondering my need to "get things done", plan ahead, etc. I never seem to just enjoy what I am doing as I am always worried about or thinking about what's next or what I don't have done or how behind I am. Nerdlution has been good for me. Even though I have been on a 10 day nerdlution-vacation. It helped me see that I do need breaks and balance. And that I have to be careful not to think too far head. Mary Lee posted this link to the #nerdlution Twitter group this week and it said a lot to me. So my word for 2014 is going to be TODAY. I am going to try really really really hard to not stress about all that is coming my way and enjoy each day whether it is a day full of work, rest, friends, exercise, whatever. I love my days but so often I get caught up on what's next or what I didn't get done, that I don't enjoy the day or what I am currently doing as much as I should. Each day is different and TODAY seems like a good word for me for 2014. And I will turn 50 in 2014. I have been telling everyone and saying I'm 50 for a while as so not to be too shocked when it actually happens. (See why TODAY is such a good word for me!) In 2012, when I started C25K, I figured I'd be in great shape by the time I turned 50. I had plenty of time, right? Well, it didn't turn out that way, but it is what it is. I'll just keep working toward that goal.